Makes you almost feel sorry for the Mackems, it must be incredibly boring watching them play week after week. Where is Martin O'Neill's management career going and where is his team going ? So to be honest, quite an important match for O'Neill here, win and he's a hero but lose and particularly lose without scoring and the pressure must increase on him. So maybe he'll play for a draw. Meanwhile over in the Newcastle corner we are little better as only Ba and Ben Arfa have scored for us this season so only 3 players on the pitch for this game have scored this season. Our main interest though is about which of our key players is fit and who do you risk in what will be a highly charged, physical match. If Steven Taylor, Coloccini and Tim Krul are anywhere near fit I think they will all play. Will Shane Ferguson continue at left back or Danny Simpson come back in if he has fully recovered from his groin strain. I think Pardew will go with experience for this one and play Simpson if fit. the second highest Newcastle scorer of all time against Sunderland. Second only to Jackie Milburn. 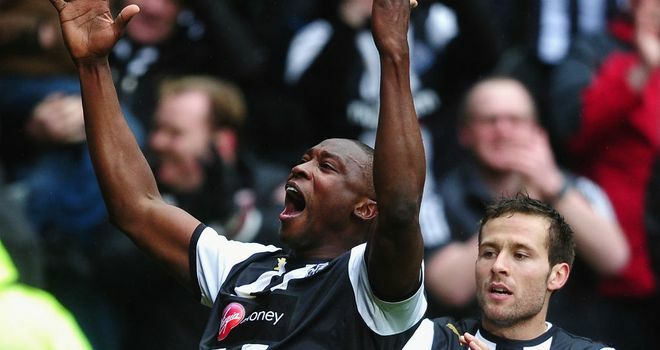 Shola Ameobi is desperate to lead the Newcastle line in Sunday's derby with Sunderland. The homegrown striker has netted seven times in the Tyne-Wear fixture - a haul bettered only by club legend Jackie Milburn. He came off the bench to salvage a last-gasp 1-1 draw when the fierce foes met at St James' Park in March and has told boss Alan Pardew he is ready to deliver all three points this time around. "Hopefully, I can keep the (goalscoring) run going," Ameobi told the Shields Gazette. "It's something important to me, but a victory would mean so much to our supporters, and also to our season. "We're all excited, and hopefully we come back with the three points. "I worked so hard in pre-season to get myself right, and then I got injured just before the first game. I worked very hard to come back and now I feel that my game is right where I want it. "I feel that whenever I'm called upon, I can do a great job for the team. It's up to the manager who he picks, but he knows I'm ready to rock and roll. "I'm fit and looking to play more games. I'm as hungry as ever." I'm not convinced on the Tiote red card. Le Tissier, Wilkins and Nile Quinn all see it as a straight red. For me he did not hear the whistle and went for the bouncing ball and Fletcher knicked in in front of him and got caught. Maybe I'm wrong but it did not look like an intentional lethal over the top tackle like they are trying to make out. Tiote's reaction afterwards and that of the Newcastle players also reflected that. Personally I think Martin Atkinson is having a very poor game and almost lost control of the match on a couple of occasions. Even basic stuff, the corner for Newcastle first half which Craig Gardner clearly put out and he gave a goal kick. Ba has just been clattered from behind on the edge of the Sunderland area in a key free kick position and he waved play on. Both terrible decisions clearly shown to be wrong by the tv replay. Really weak refereeing by Martin Atkinson again. Coloccini booked for dissent as a non existant tackle from Ben Arfa is blown for a foul right on the edge of our box. It was unfortunate that Coloccini got injured and had to go off with ten minutes still to play. We never looked steady at the back when he left, he had a fabulous match. The worst substitution for me was taking off Ben Arfa who I thought was playing really well, working hard and really into the match. It got worse when his replacement was then Obertan. I guess Pardew had the theory that the pace of Obertan would stretch the tiring Sunderland defence as they pushed for a winner. In reality the total crapness of Obertan shone through as he was totally unable to get any where in the match at all and it significantly weakened our team for the last 5 minutes. So I would say every player for Newcastle today was a hero with the exception of fore mentioned crap player who really needs a minor miracle to make him into a professional footballer. But hey, James Perch was great today so there is hope for Obertan yet !!! I think the key difference between James Perch and Gabriel Obertan is that Perch arrived here with very little expected of him. Nottingham Forest fans seemed delighted to offload him for actual money claiming he was awful. To me it just seems like they played the lad in the wrong position. He had never looked like a full back to me but he does slot in nicely in front of the back four when asked. He's clearly not a first eleven player by any stretch but is able to come in and do a good job. What will be interesting is where we go from here. We have the European match on Thursday night against Club Brugge which is one I think we will want to win to put some daylight between us in the group. Will we see Obertan, Ameobi, Marveaux, Anita etc all brought in for this game given we have another home game next weekend? I think it's fair to say at this point that football most certainly does need video replays. Given the amounts of money involved in the game and being put at risk every single week by the decisions being made by officials I cannot support any reasoning against it. The old pros who feature on the post match panels, Sky punditry and radio shows all seem to be against it but to me these are the views of dinosaurs of the game. To suggest that 'things level themselves out over the course of a season' is completely ridiculous. In my opinion if you don't want video technology to ensure the right decisions are made then you are not backing the FIFA motto of 'Fair Play' and instead promoting the concept of cheating and deception. Football is fast becoming a sport that is being left behind as others embrace technology and use it to enhance the integrity of their sport. Even at events steeped in tradition such as Wimbledon, technology has subtley been introduced for the better. Football needs to come out of the dark ages and join the rest of the world. Do rather like this picture. Which one of these players got sent off ? ?